This small beach is not located on Santorini island but at northeast of Palia Kameni island. Palia Kameni (or Palea Kameni) is the smallest of the two volcanic islands, Palia Kameni and Nea Kameni, in the middle of Santorini Caldera which was created after a volcanic eruption. The landscape is wild, with black rocks and the water is warm due to the thermal springs of the area. Swimming to Palia Kameni beach is one of the unique experiences that Santorini has to offer. Swim in the hot thermal spring’s water is a unique experience! 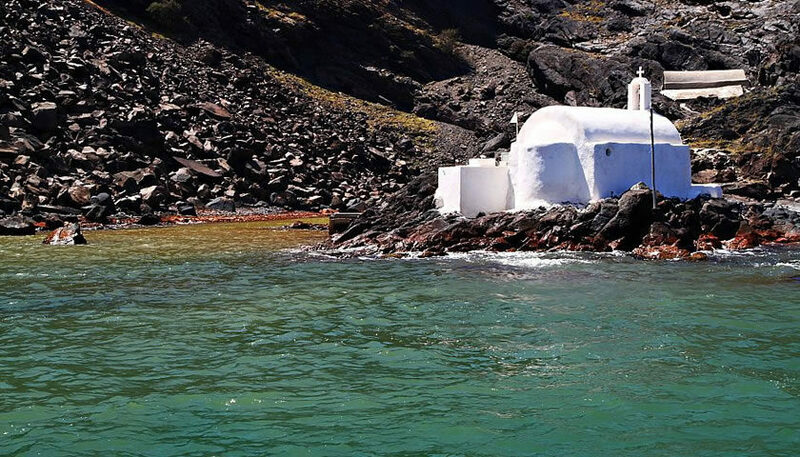 Access to Palia Kameni beach is only possible by boat from Athinios (the main port of Santorini) or Fira’s port. It is very close to Nea Kameni where you can visit a volcanic crater. There are many daily cruises that you can join in order to visit Palia Kameni usually combined with Nea Kameni volcanic crater and hot springs.